Thirsty Milo started when the founder, Mark, brought a puppy, that he wanted to naturally take out and about with him as much as possible. The puppy's name was Milo. After trying to find a bowl that met all requirements to be fun, functional, funky and stylish, as well as being portable, easy to use and hold a good volume, he discovered there wasn't one. 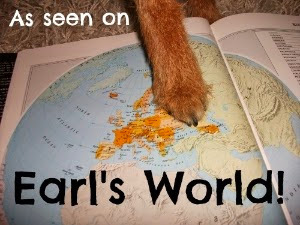 So he invented one! 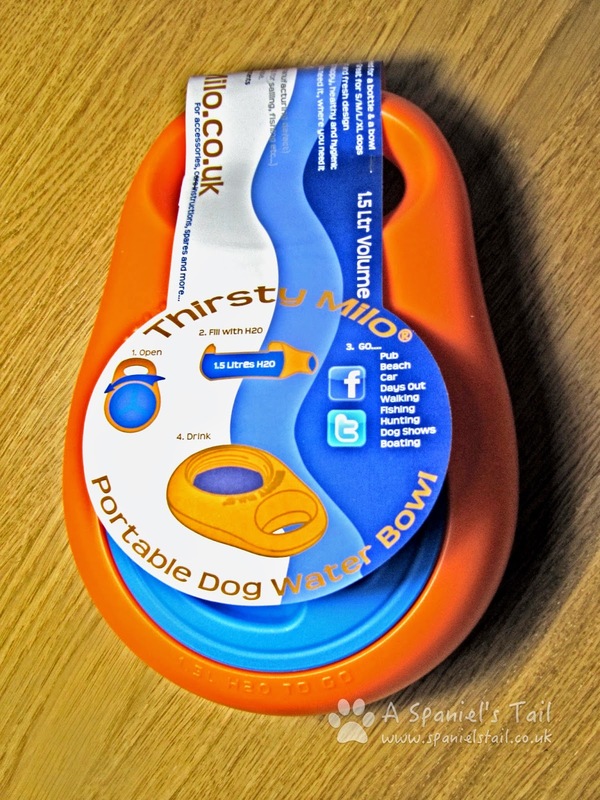 Targeted towards those dog lovers that love to share all aspects of their lives with their dogs, including when out and about, and to be adaptable to all situations - days at the beach, car or coach trips, day trips, boating, camping, etc, he designed the bowl to do as the slogan on it says: "1.5L H2O TO GO"! So what's so special about this bowl? Easy to fill: A giant 120mm hole means it is easy to fill this bowl from any fresh water source. This same gap also makes it easily accessible for the dog to drink from - just like a regular bowl! 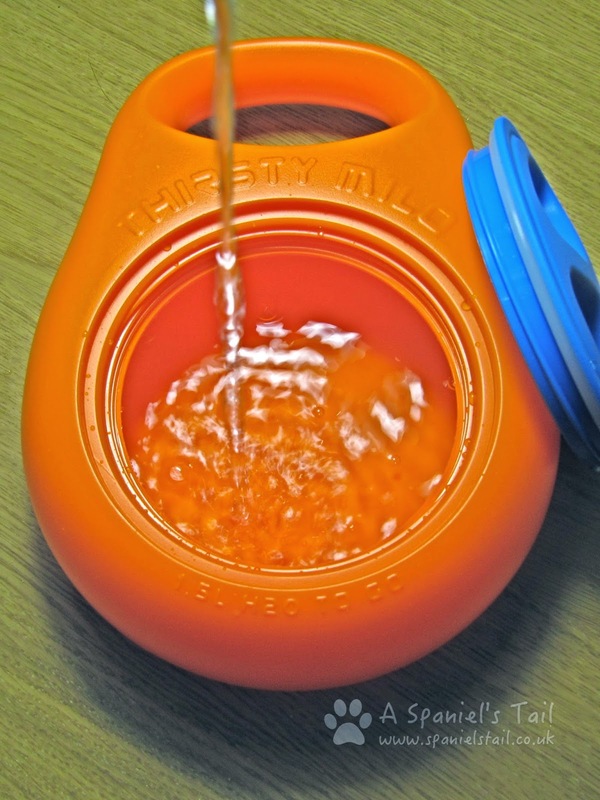 Easy to use: Just fill up the 1.5 litre bowl with water, screw down the lid and you are good to go! You only need to carry the bowl and no bottle, so great portability. 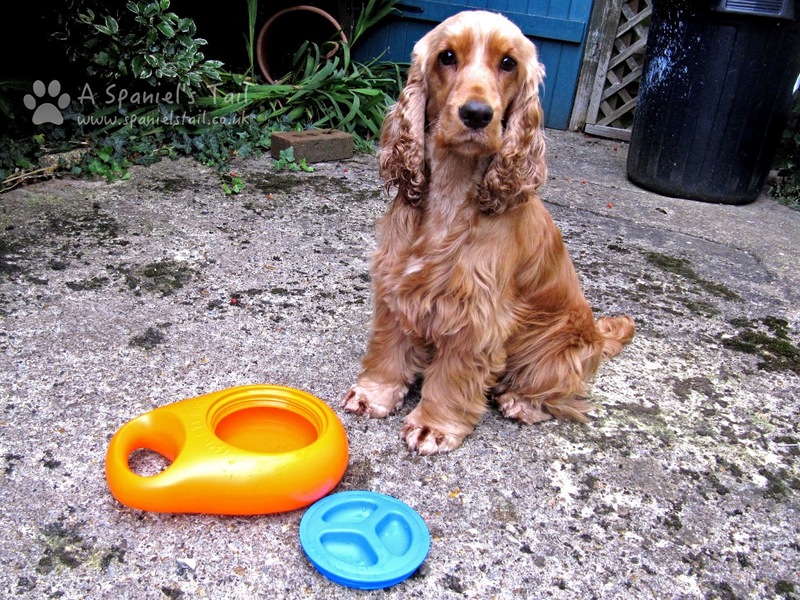 Functional: The bowl holds its shape, you don't need to hold it for the dog to drink from, and it is easy for dogs of all sizes to drink from (and has even been used by cats, ferrets and small horses!). And if you are a boat dog, it has even been designed to float (when the lid is on) even when full! 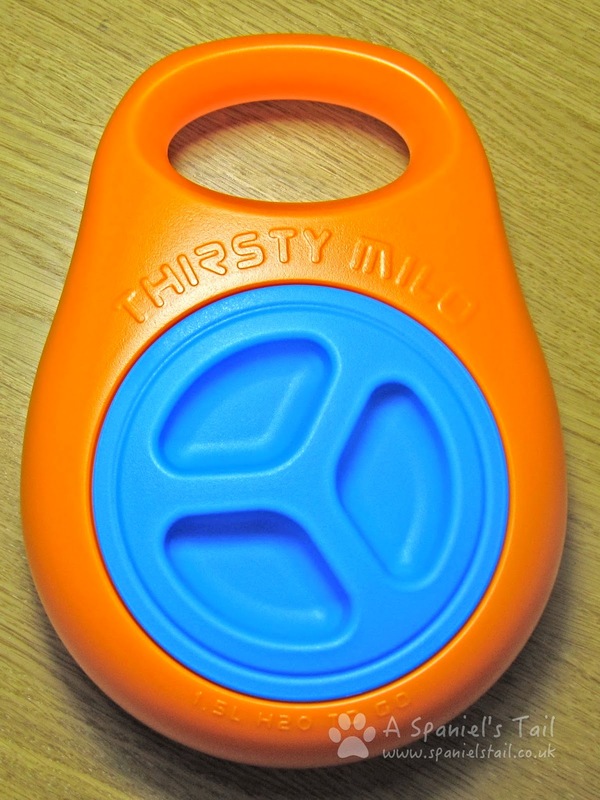 Good materials: The plastic used means the bowl is very sturdy, and is of the same grade plastic as used in the manufacture of human food and drink containers. The plastic is recyclable at end of life, and is easy to clean with just a little soapy water. 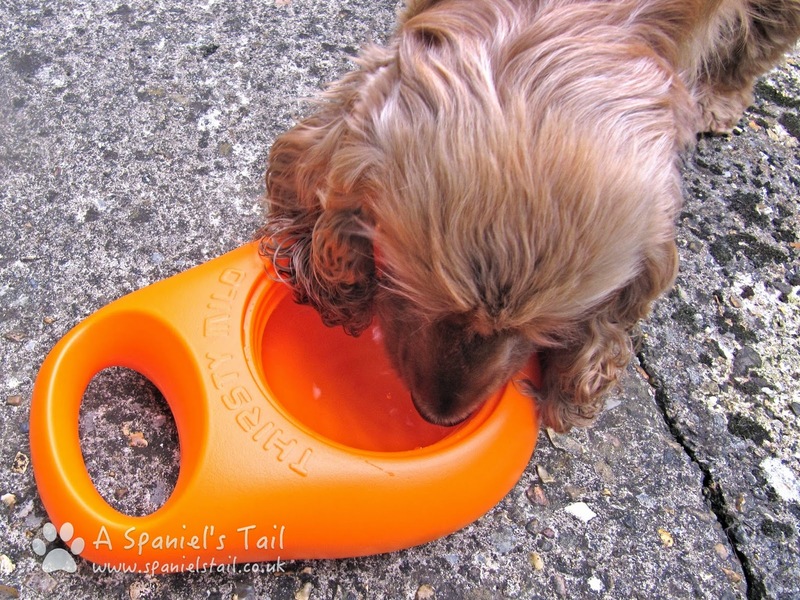 Stylish: The bowl is a contemporary, fun design and is available in different colourways - bright zingy orange like mine, or a hot pink for the princess pooches. Having always used those rather flimsy bottles that fold out from a tray (we had one completely snap off at the neck once which was messy! ), we really like this bowl - it's very sturdy and hard wearing, and Hooman did a fair bit of chucking it about in the garden to see if it leaked at all. Not a drop, thanks to the rubber seal in the lid! I took to it like a duck to....er water... the only problem we had was when Hooman was trying to photograph it and I ran off with the lid. Well, it looks like a toy! The bowl holds a massive 1.5 litres, so while this might not be something you would want to carry around with you by hand on an entire walk, it would be awesome for having in your car / caravan / tent / backpack. In fact, Hooman would love to see a smaller version of this for people like her who don't have a car - a dinkier 0.75-1.0 litre one would be fantastic to have for train and bus journeys where weight is everything when you are also trying to handle a bouncy dog. Saying that, the bowl is light when empty, so we would probably just not take as much water with us. We love the design too in the bright funky colours. Good job Thirsty Milo - top barks from us! 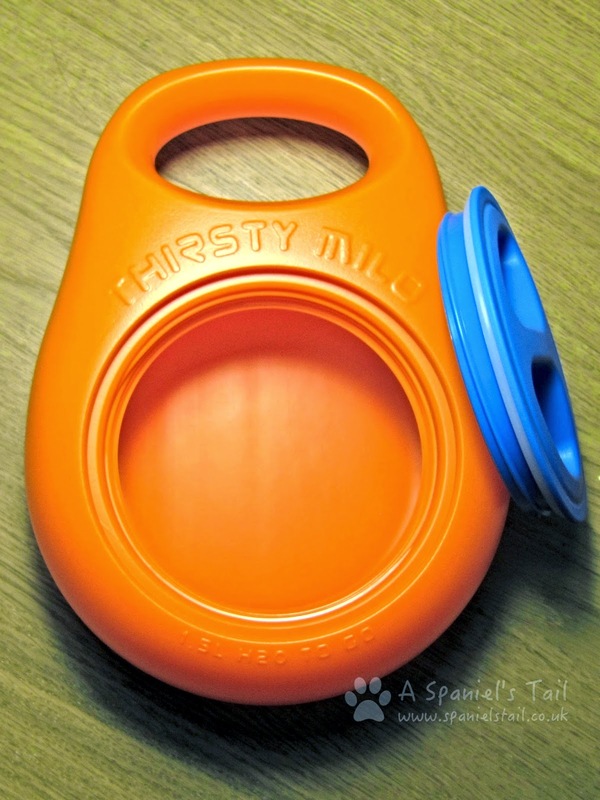 You can buy Thirsty Milo in two colourways and it costs £14.99, either direct from their website, or from a number of stockists (check here). What a great bowl for travel! We love that it's all in one and we love the colors! Fun idea and fun colours. Have a serene easy Sunday now.